So, I guess with this post I have to finally admit to more than just a few people that I am online dating… Or rather, I’m “online looking” since I have unfortunately been on very few actual dates. Let me start by saying, obviously not all men need help… but, from what I have experienced, so. many. do need help. To be clear, I also cannot comment on whether women need similar help (or the same advice) since I am looking at only men’s profiles. This post is meant to be humorous… However, every. single. point. made. comes from one (or a plethora) of men, and therefore everything below is factual. 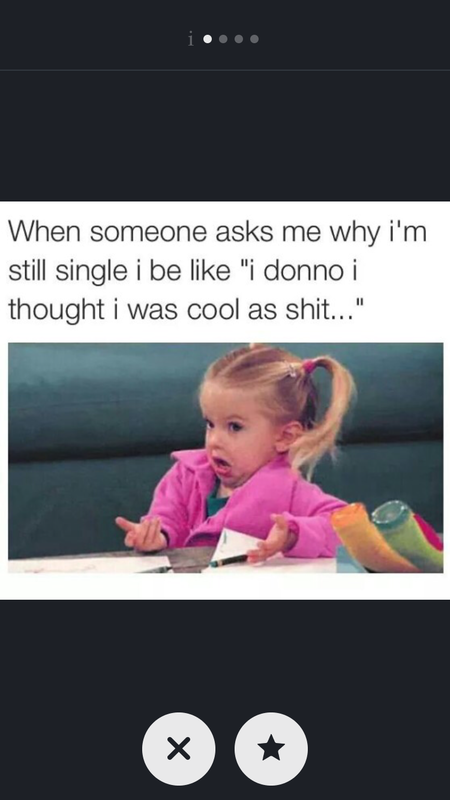 Let’s start with, you do need to actually be single. Then, hell no, I am not talking to you. No, we are not going to be friends because I won’t be the one helping you to be a cheating husband… Move along. Then, I’m left to assume you are the Craigslist killer and I can’t let myself go and get into your car… That’s how people die. Eyes. Men, eyes are important. Then, I’m left to assume you have crazy serial killer eyes. Abs are so great. Face is better. Then, while I love me some great abs, unfortunately I’m left to assume your face it is horribly disfigured or your compensating. Your face matters. Please, for the love, take photography lessons. Then, you are definitely not catching my attention for the good. Maybe google selfie angles. No one wants to be that close. Then, maybe you have nugget arms or your phone should back up an inch or 15. Please don’t make me explain why I’m not interested. Then, I’m probably not interested, don’t ask me why, and make me tell you potentially hurtful things because I won’t lie to you. Then, you are probably too short for me to feel comfortable with you… Don’t worry, another woman won’t care like I do. I’m a heightist, it’s a real thing for me I’ve stopped apologizing. Then, I’m hoping you are the attractive one. You are never the attractive one. You do actually need to have friends though. Then, I must assume you have no friends, which makes you either socially awkward or a narcissist. Neither of which am I interested in. Let’s be clear, just don’t with the stupid confusing opening lines. Just. Don’t. Then, you are certainly not getting any sort of response. Figure your life out. I didn’t ask for a picture. Then, stop embarrassing yourself by sending them. There isn’t going to be a return picture. If you ask for an updated picture and I say no..
Then, maybe try asking me on a date to see what I look like currently. I look way better in person than in one of my ridiculous selfies I send to friends… Trust. But for real, it’s called “online dating”, let’s actually try going on dates. Then, let’s actually try a date, laugh, talk, flirt, and enjoy getting to know someone new. I don’t want a digital pen-pal. This entry was posted on August 22, 2015 by kpbback in 2015, Boys, Dating, Emotions, Feelings, Frustrations, Girls, Guys, Humor, Laughter, Loves, Men, Online Dating, Relationships, Single, Singleness and tagged Boys, Dating, Dating Guys, Dating Men, Dating Tips, Dating Tips for Guys, Dating Tips for Men, Emotions, Falling in Love, Guys, Humor, Love, Men, Online Dating, Pickup Lines, Relationships, Selfie, Single, Singleness.